Special thanks to guest writer Doug Smith for attending this event and representing #pdxbeergeeks. Also on a side note, tonight is the grand opening! 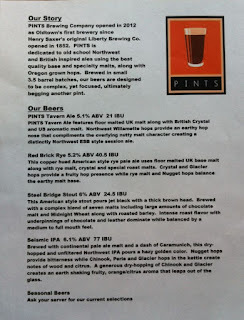 Stop in and show Pints some #pdxbeergeeks love! 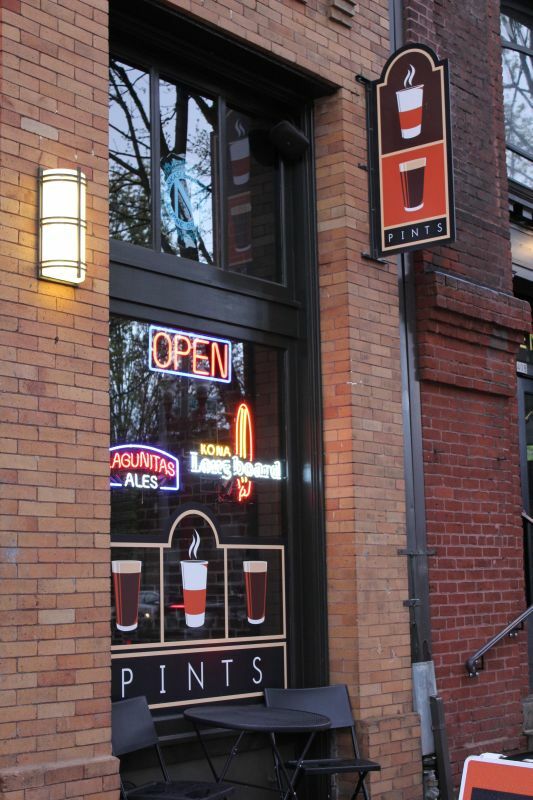 The Old Town district of Portland once again has its own brewery. 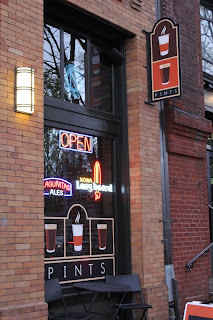 PINTS Brewing Company is the first brewery to open in Old Town since Liberty Brewing Company, which was opened in 1852 by Henry Saxer. It’s been a long time coming, and it’s been worth the wait. Owner Chad Rennaker has spent a lot of time in Denver, frequenting Great Divide Brewing. He wanted to implement many of Great Divide’s features while designing PINTS, envisioning a small, low-key venue with somewhat limited food options that is primarily about the beer; a true destination for the craft beer geek and causal beer fan alike. It seems his vision has definitely been realized. Coffee shop by morning and “urban taproom” by afternoon and evening, PINTS is an inviting, warm space with low lighting, exposed wood beams, and old brick walls that greet you immediately upon entering. There is currently seating for around twenty-five in the main front area, with additional seating at the bar. There is one flat screen TV in the corner. I had the opportunity to sample four of their core beers, as well as two of their current seasonals. 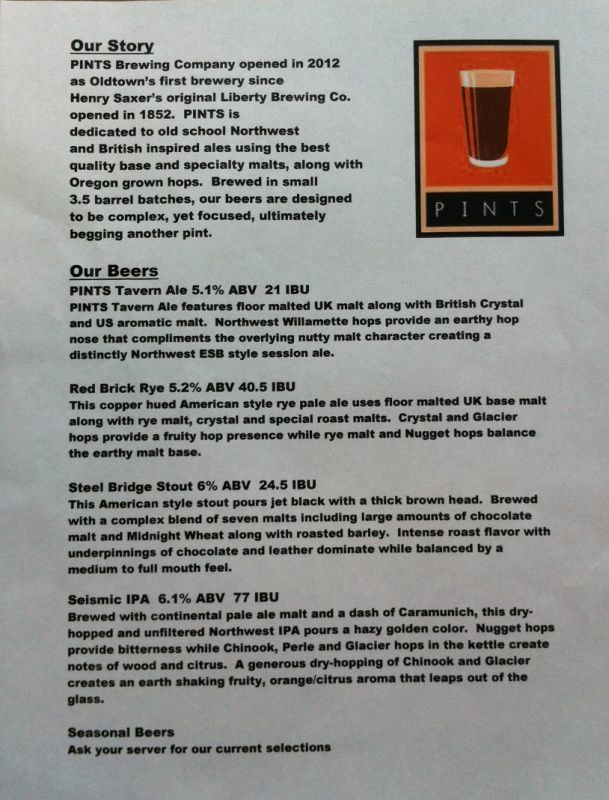 The core beers were PINTS Tavern Ale (a sessionable Northwest ESB), Red Brick Rye (a copper-hued American style rye pale ale), Steel Bridge Stout (a complex American style stout brewed with seven malts), and Seismic IPA (a dry-hopped and unfiltered Northwest IPA). The two seasonals were the as of yet unnamed Northwest red ale (they are holding a contest to determine a name), and the Legalize Wit (a classic wit beer which was a collaboration with Lompoc). All six of their offerings were extremely solid, and there is definitely something for everyone. Beckwith’s favorite style is stout, so look for some great roasty dark beers coming from PINTS in the very near future. 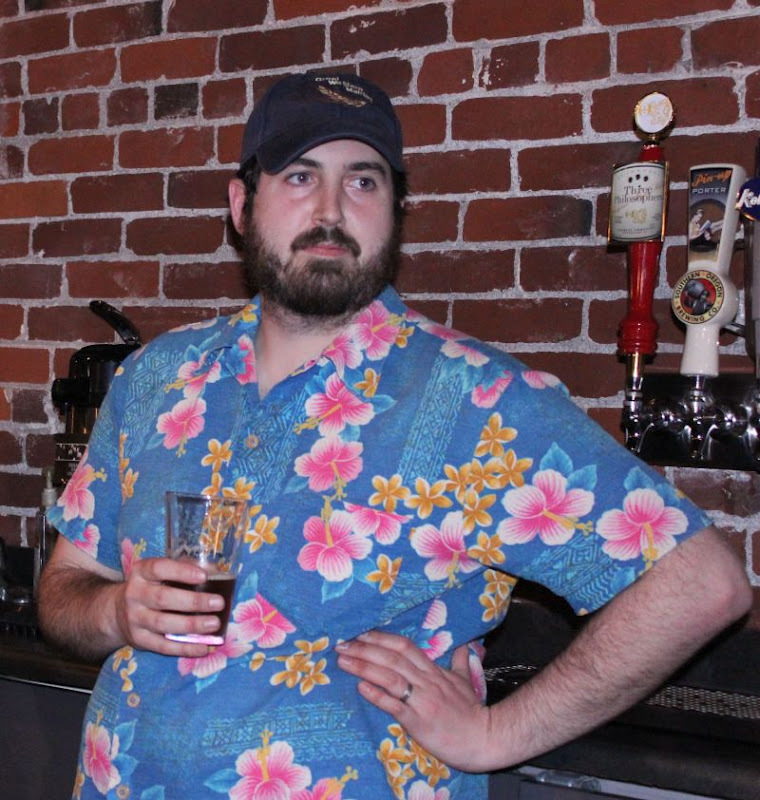 Beckwith plans to experiment with the use of various base malts, which is not all that common in the Portland brewery scene. Rather than using only a couple of base malts in all of his beers, he will use a variety of malts that truly compliment the styles. This should provide a very distinct range of flavors, mouthfeels, and aromas. The yeast strains used will also rotate between various American Ale and English Ale yeasts. Future plans include expanding the seating area into the brewery so that patrons may enjoy their beers right in the area in which they were created. You can’t get any closer to the source than that! Beckwith also plans to brew a beer for this summer’s North American Organic Brewers Festival, which will be a summer IPA called “Green Line,” named for PINTS’ direct proximity to the green Max line, as well as its status as a “green” (organic) beer. There will be a food menu, however; the kitchen is still under construction. Beckwith’s goal is to “try to get people to think a little bit more about what’s in their pint glass.” If they can accomplish that, then he feels that they will have succeeded. With a great location right on two MAX lines, a very inviting space, and their excellent beers, that shouldn’t be difficult at all.